Does Your House Welcome You Home? Other than your golden retriever, what says “Welcome Home” better than an open, organized, well-lit, warmly decorated entryway. Isn’t it nice to swing open the door, hang up your keys, dock your cell phone, stash your purse, and find a free hanger for your coat? … That rarely happens, you say? Still tripping over sneakers and backpacks? Gotcha. Well, how about a New Year’s Resolution to start with the entryway — whether you come in through the garage or the front door, it doesn’t matter. There are so many organizing ideas available now to help you customize an entry to fit your family and lifestyle. And although some require talent with power tools, there are many other options including stackable cubbies and DIY shelf systems that will tame the clutter. 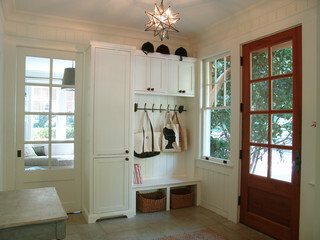 Light woods and white are wonderful in entryways that lack natural light. But if you have large windows, any favorite wall color will look great. Consider choosing an accent color from an adjoining room to give you the “flow” you’re looking for. Before you tackle any other in-home projects this coming year, make sure your entryway welcomes you home. I’m here to help. But before that, if you have children, then forget about it. Do up the most spectacular Christmas you can imagine and enjoy the blinking lights and the kaleidoscope of colors for as long as your children appreciate your home’s transformation. And for the young-at-heart who still enjoy reliving this most festive time, then relax. Go ahead and hang all those old ornaments on the tree. The holidays are for celebrating and reminiscing too. Now for those of you who would prefer a light touch to the holiday decorating and would like to create an oasis from the mall madness, this tip is for you. Limit your holiday color scheme of ornaments, ribbons, and decorations to white. That’s it. Then, just as the photo suggests from http://www.traditionalhome.com, add the necessary sparkle with glass ornaments, silver and gold metallic objects to reflect candlelight, and simple greens. You will be amazed at how festive your home looks without even an ounce of Santa’s sleigh red. 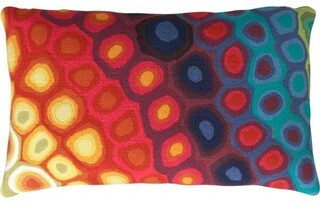 You are currently browsing entries tagged with Zen at Your Home & Color Coach.